A long-term study on acidic rainfall has been carried out by researchers at the University of Illinois. It shows that emissions regulations do indeed appear to have a real impact on the environment. The National Atmospheric Deposition Program has been collecting samples of rainfall from over 250 different stations across the U.S.A. on a weekly basis. It has then been analysing them to see what pollutants are contained. 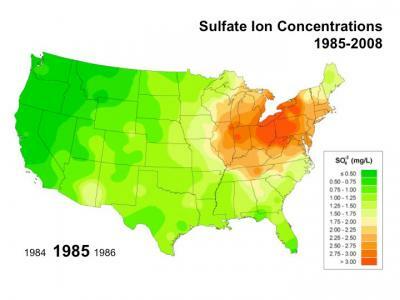 It is this program that has recently released a full report that details the frequency of acid rain and the concentration of it over a twenty five year period, covering 1984 through to 2009. A researcher in the program, Christopher Lehmann, said, "This is the longest-term, widest-scale precipitation pollution study in the U.S. In particular, we wanted to see how the trends in the pollution and the rain correlated back to emissions regulations," he continued, "We're seeing regulations on emissions sources having direct and positive impact to reduce pollutants in rain." Acid rain is known for its detrimental effects on the ecosystem but it also has an effect on infrastructure and even the economy. Polluted rainfall has negative side effects on plenty of industries, including fishing, forestry and agriculture. Acid rainfall is also capable of eroding roads and structures and damaging buildings. The report showed that rain or snowfall with a pH value of 5.0 or less decreased over the period of the research in both frequency and also concentration. This decrease has been caused, researchers believe, by the changes made to the Clean Air Act 1990 which put firmer regulation on the emissions of sulphur dioxide and nitrogen oxide. It is these emissions that become acidic when mixed with rain fall. Lehman explained the simple principle, "What goes up does come down," Lehmann said. "Rainfall chemistry directly correlates with air pollution. When we looked at the magnitude of the trend, we found it compared very well to the magnitude of the decrease in emissions reported by the EPA (Environmental Protection Agency)." The data shows that sulphate emissions saw a 50% decrease during the research period and nitrate emissions were seen to drop by over 30% over the same period. This has coincided with a similar decrease in the frequency and concentration of acidic rainfall across the United States. David Gay was the coordinator of the program, he said, "You want to make sure that the regulations you put in place are effective, that they do what they were designed to do. That's why we're here. We spend a lot of money to promulgate regulations. There's a lot of concern about their impact on industry. This study shows clear, significant evidence of the direct impact of regulation." 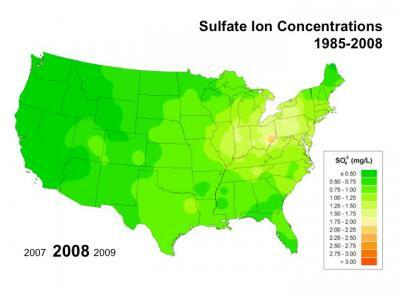 It is great news that acid rain is on the decline but it remains a problem. Lehman had the final word on the subject, "We still have acid rain. Yes, the trend is down, and we should celebrate that, but it's still a problem. There is still progress to be made, and there are new regulations coming along to continue to reduce emissions of sulphur and nitrogen compounds."